As the 2017 music, books and ideas festival season gets going, it’s time to reflect on those colourful, animated jamborees that break out in random, rural corners of Britain, regardless of the weather, throughout the summer. The Hay Festival is the most comprehensive and concentrated (so incongruous in a tiny town, compared to the annual bash in, say, mighty so-easily-reached Edinburgh) featuring books, ideas, music, politics, comedy and science. My “Notes from a Late Convert” are here. And this from our 2017 visit. But there’s never any debate about which is the biggest event, burning bright above our musical summer like a fiery musical comet. There is such an unrequited audience beyond those lucky enough to get tickets, that the BBC treats it would a big sporting date like Wimbledon, and devotes many hours of live coverage over several channels to satisfy them. That’s Glastonbury. I’ve never been there, but recently I had the chance to experience the only popular musical event to bear comparison, the smaller WOMAD (World of Music, Arts and Dance), a three-day festival somewhat incongruously held deep in the English countryside. This too, applying several measures, was an outstanding success. There was a record, sold-out, attendance in 2014, the first time this has happened at its current venue, where it has been held since 2007, Lord Suffolk’s Charlton Park in Wiltshire. There was abundant good humour. And the sun blazed down throughout, apart from one short, rogue, shower which inconvenienced no one. Seasoned festival goers will surely agree that, after you walk through the gate on the first day, these events hold you in their grip. You step outside the world for the duration, and willingly detain yourself behind an invisible force field. Perhaps it’s the addictive, almost constant exposure to music, from late morning until the early hours of the next morning. And the intoxicating, uplifting sense of pageant, under so many flattering, shining flags. It’s the childhood memories evoked, in the vintage steam fairground with authentic steam-powered roundabouts, and gallopers. It’s the artist in residence, a version of Sisyphus in evening dress, but on the flat, condemned to laboriously push a chalk boulder along a path. It’s the stalls, many of them selling or promoting things and services that are actually good for the world, such as collecting old bikes for Africa. It’s the food, a good proportion of it from sustainable sources. The children’s workshops, where they make wooden xylophones; the music making, face painting, cookery sessions; tuition in intimidating Southeast Asian instruments. It’s the Children’s Procession on the last afternoon. It’s a glass of crisp white wine in the tranquillity of the Arboretum. So while the rest of the England carried on normal everyday life, we were immersed in this great, exuberant musical bazaar. It makes sense to stay for at least two days over the weekend, which lasts from Thursday to Monday morning. Some people had no choice anyway. Our camper van, kindly lent to us by the Caravan Club, was completely hemmed in by tents, which continued to edge closer and closer, taking up impossibly small pieces of land, in the back stage camping area, rendering escape impossible. Music wafted quadraphonically around us, from nine stages, as we sauntered around and queued for food or coffee. On one day we attended nine performances, spread over about 13 hours. We went from Spain, the Coetus Orquestra de Percussió ibèrica, to Croatia for Goran Bregovic’s ecstatic Wedding and Funerals Orchestra. From Peruvian chica and Colombian cumbia, distilled in Brooklyn, to the big brass blast of Trombone Shorty from New Orleans. We ended that prodigious musical day, although it didn’t feel like overload, with leisurely saunters built in, at the unlikely but winning alliance between Wales and Senegal, harpist Catrin Finch and Senegalese kora player Seckou Keita. Womad was launched, and is still run, by musician Peter Gabriel. An original idea in1980 led to the first WOMAD festival in 1982. 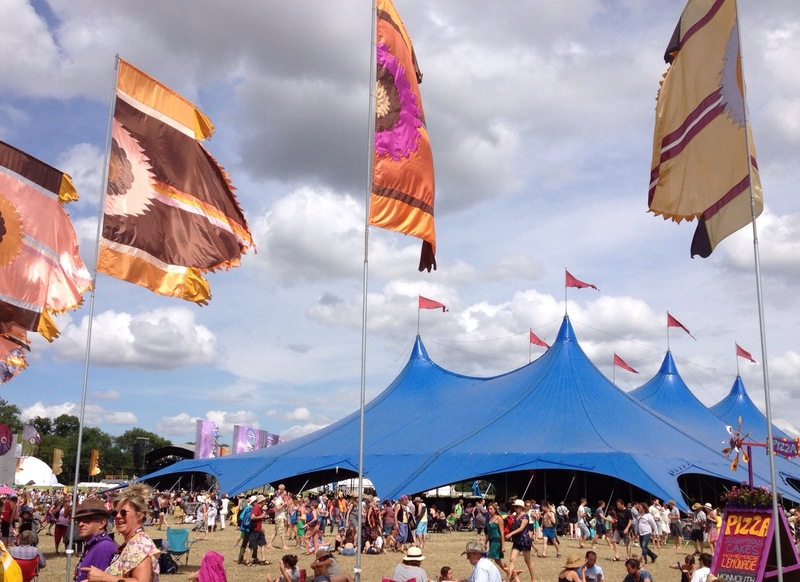 Since then WOMAD has held 160 festivals in twenty-seven countries and islands. Now it’s on the Charlton Park Estate, a radical reuse for land “mainly arable, with a few beef cattle and sheep”, half a mile from Malmesbury, 1000 years old and said to be England’s oldest borough, on the edge of the Cotswolds. The medieval abbey contains the tomb of King Athelstan, the first king of all England. The festival is good for the town, but I wonder is the restaurants did much additional business. There was food from sustainable sources from many good quality outlets at WOMAD. The public was asked to tweet their favourite. We queued several times at our choice, the Goan Fish Company. It is always a contender. And the coffee at our preferred (out of many) stand, Callum’s Coffee, was consistently good, and at a price no High Street concession can match. As at any big, extended public event, one nagging concern afflicts us all. The toilets. Pristine on Thursday afternoon, could they make it to Monday? It was all in the plan. The least pleasant job at the festival was carried out with high diligence. The many toilets were cleaned frequently, and the paper, soap and chemicals refreshed. With so many thousands of people driving here, the festival can hardly claim to be truly green in any serious sense of the word. However they did lay on frequent buses to the nearest railway station, at Chippenham. And they addressed some of the other perennial environmental concerns. There were recycling stations simply everywhere. I don’t think that old adage about how close you are to a rat applies here. They would have found nothing to eat. You are never more than 100 meters away from a recycling station. If you bought a heavy duty plastic container from the water charity Frank, you could have it filled for the duration for nothing with fresh filtered water. And on the last day another charity FareShare South West, turned up to take away all the uneaten food, and redistribute it to organisations working with vulnerable people. It came to the equivalent to 4,762 meals. Ecotricity, one of Britain’s leading green energy companies, was at WOMAD once again. It hosted the Big Green Britain chat – although few in the audience seemed to require much conversion – chaired by Jon Snow, with Robert Llewellyn, Simon King, Dale Vince and Geetie Singh-Watson. It may seem that I’m painting an excessively rosy picture, but it was hard to find fault. Maybe some of the security men, standing with shaven heads in the full sun for three days (unless they were doing it out of bravado), could have been issued with hats. WOMAD’s own official injunction was – “Remember water + hats + suncream + shade!” And were our security wristbands the sort that can’t be recycled? As for the music, we did walk away from one dreary and self-regardingly pious performance, but there were plenty of uproarious, foot-stamping sessions to compensate. And the headline act, Senegalese singer Youssou N’Dour, a WOMAD performer across three decades, would distinguish any festival in the world. It was good to know that we didn’t have this music all to ourselves. You didn’t have a ticket for Glastonbury? Plenty of coverage on the BBC. The Hay Festival is too far away? Now the BBC is there. And so it is at WOMAD, well covered on Radio 3. The final gig we attended, was the happy incongruity of the Magnolia Sisters Trio from Louisiana, playing live to the world from a Wiltshire field on a brilliantly sunny afternoon. Thank you, BBC. Let the last word go to the Western Daily Press. It reported this when it was all over. “When an army of cleaners arrived for the big clear-up at the Glastonbury Festival, the mess took weeks to clear. But when the crew at the WOMAD Festival arrived to do the same job, they found themselves rather redundant. “For the well-behaved revelers at WOMAD tided up after themselves so well, that absolutely nothing was left to clear.